Ever since I heard Gideon Nxumalo’s very subtle piano hint to Nkosi Sikelel iAfrika in the opening bars of his 2nd Movement on the classic 1962 live recording, Jazz Fantasia, at the Wits Great Hall, I had been compiling a casual list of the various other recordings of this classic hymn and anthem. 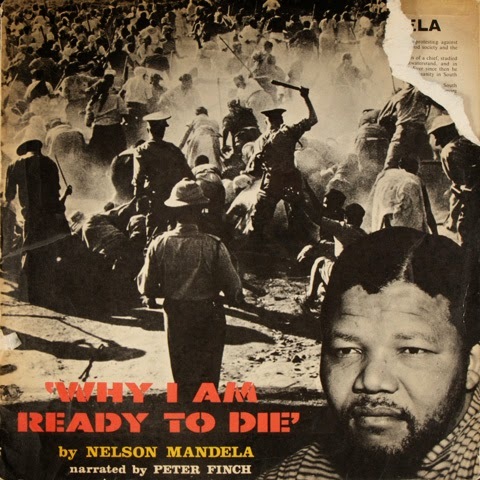 At that time the song had supposedly been freshly banned by the apartheid authorities and any performance was, according to some sources, prohibited. Which might explain Nxumalo’s exceptionally subtle approach. I thought then how an examination of this anthem along with its various iterations might be a potentially interesting subject for a future post. Recently, I was contacted by Anders Kelto, a reporter for PRI and BBC’s radio programme The World, who was looking for early recordings of the South African National Anthem in any of its various forms. I sent Anders my compiled list with the information that I had collected to that point. Of course, one thing led to another and I continued expanding on this research. The post below is the result and covers the history of the recordings not only of Nkosi Sikelel iAfrika but also the various other songs, Morena Boloka, Die Stem, and The Call, that make up the Anthem. In the process of doing the research I was greatly assisted by and would like to thank Christopher Ballantine1, Gabriele Mohale2, Brian Willan3, Diana Thram4, Liezl Visagie4, Jonathan Ward5, Alan Kelly6, Pat Liebetrau7 and Andrea Vorster.7 In addition I would like to thank these institutions: the Department of Music at the University of KwaZulu-Natal; Historical Papers at the University of the Witwatersrand; the International Library of African Music (ILAM) at Rhodes University; Digital Innovation South Africa (DISA); and the South African Music Archive Project (SAMAP). The essay below is structured around each stanza of the current anthem with a detailed analysis of the early recordings that led to its final state. The text is a work in progress and some recordings remain without contextualisation but nevertheless have been listed in the interests of compiling this discography. I will continue adding details about each recording as information becomes available and time will allow. A chronological discography of many of these recordings can be viewed at flatinternational. With the adoption of the hymn by the ANC as its official anthem, the song was sung at many official events. But it could also be heard at most gatherings of protest and subsequently became a rallying cry and symbol of resistance. The role of the hymn in this way shifted from a religious to a political context. 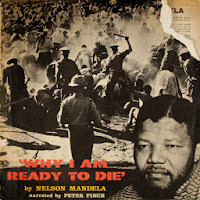 By many accounts, the song was apparently banned by the apartheid government after the Sharpeville massacre of 1960, when both the ANC and PAC were outlawed, but I am still searching for more specific documentation of this ban. Ironically, there were examples of the song being tolerated by the apartheid government in the 1960s and this is discussed in more detail below. Zonophone 4168, matrix Bb3640-2If one consults His Master’s Voice / De Stem van Zijn Meester, the Dutch Catalogue in Alan Kelly’s excellent series documenting the discographical history of the Gramophone Company Limited, one will find an entry for six tracks by Sol Plaatje on page 88.25 Solomon Tshekisho Plaatje was one of the founding members and the first General Secretary of the SANNC and it is he who made the first recording of the hymn in London in 1923.Plaatje was part of the SANNC delegation that traveled to the UK in May 1914 to present their case of protest against the Natives Land Act of 1913, in hopes that the British government would aid in the law’s repeal. The Act, for the most part, disenfranchised blacks from owning land in the Union of South Africa. Plaatje would return to South Africa in February of 1917 after the publication in England of his critical book Native Life in South Africa the year before. He then made two additional journeys to the UK, leaving South Africa in June 191926 and then returning again in September 192227 after spending nearly two years in Canada and the United States. Plaatje’s recordings were subsequently made at the Hayes studios in Middlesex, London in the last few days of his final visit. He departed for South Africa on October 26, 1923.28Plaatje had returned to the UK after the United States partly to seek funding to publish his translation of the Fellowship Hymn Book used by the International Brotherhood Congress.29 Brian Willan, in his excellent biography on Plaatje, believes that he may have been introduced to “people in the gramophone recording world” after a month long participation in a performance titled Cradle of the World, at the Philharmonic Hall in August 1923. The elaborate event included the presentation of a wildlife film shot in central Africa sprinkled with live sketches meant to illustrate parts of the film. 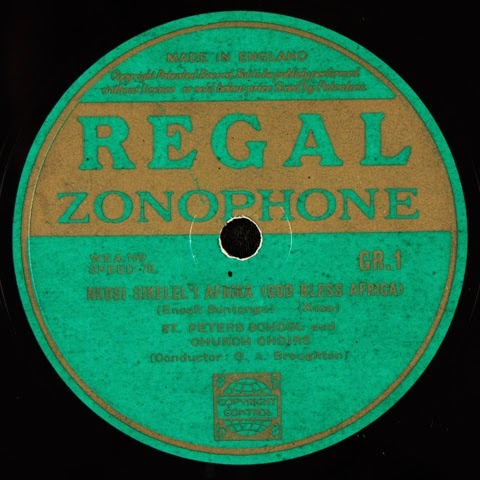 While the larger production itself had some mixed reviews in the press, it did give Plaatje the opportunity to employ his singing talents.30The UK based Gramophone Company Limited (home to labels like His Master’s Voice and Zonophone) was one of the first companies to issue South African music and had sent a recording engineer George Walter Dillnutt there with a mobile unit in March and April of 1912.31 The unit recorded material in Johannesburg and Cape Town that was subsequently issued on 78 rpm shellac discs and marketed in South Africa on the company’s Zonophone label as the 4000 series. The company would continue to make recordings in the 1920s and 30s at its head office in London and these included the seven tunes by Plaatje. 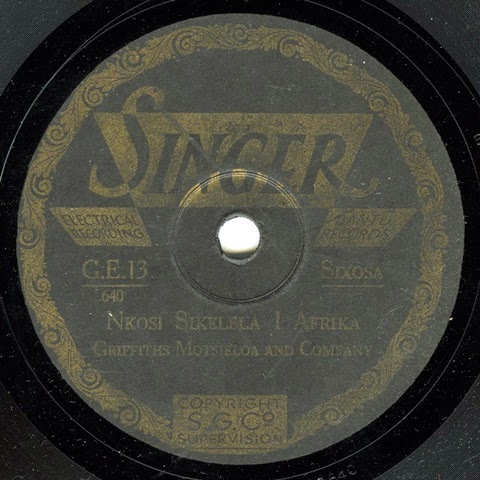 Interestingly Plaatje in the recording of Nkosi Sikelel iAfrika is accompanied by Miss Sylvia Colenso on piano. She was 36 at the time, and in addition to piano contribution her voice can be heard in the background repeating the refrain “Osa” — her ‘response’ to his ‘call’. What strikes me about this musical pairing, this collaboration if you like, is the way in which it bears witness to the crossing of racial and gender differences. Here a black man and white woman perform together the very first recording of the future South African National anthem. This simple collaboration comes to stand powerfully and symbolically for what a future ideal multi-racial South Africa could be. Sylvia Nellie Colenso was born in London in 1887,33 and yet her connection to South Africa and its history is deep. Her grandfather, John William Colenso, was the famed social-activist and controversial first Anglican Bishop of Natal. He died in Durban in 1883. His daughters followed the liberal path set by him in South Africa. For example Frances Ellen Colenso published two books in the 1880s on relations between the Zulus and the British, while Harriette Emily Colenso became an outspoken critic of the Natalian authorities and their treatment of the Zulus.34 Sol Plaatje on his first visit to London had befriended the Colenso family, particularly Sophie Colenso,35 the widow of Francis Ernest Colenso, the Bishop’s son. It was with their daughter, Sylvia, who played piano, that Plaatje made the recordings. One discographical detail about the recording is that the matrix number is listed as Bb3640-2, with the “2” suggesting that there was an earlier take of the song made. Some further research would need to be undertaken at EMI Archives to determine whether that first master disc still exists and if it also included the singing of Nkosi Sikelel iAfrica. Another small detail regarding the matrix numbers in Kelly’s research is that Singa Mawela (matrix Bb3643-1) is listed as being recorded on October 16th, 1923 whereas the remaining two tracks he lists as recorded on October 23 have lower matrix numbers (Bb3641-3 and Bb3642-3). The “3” at the end of these numbers suggests that they were the third takes of each song. It is my guess that Plaatje had made the first takes on October 16th and then was asked to come back to the studio and make the additional takes on October 23rd as the earlier ones may have been deemed inadequate. This might also explain why different pianists were used on the later recordings as perhaps Miss Colenso was unavailable on the second occasion. Multiple takes on different days usually still carried the initial number of the first take. The fact that Kelly lists the tracks not only in his T-series (T for Twin) discography38 of Zonophone records but also in his book His Master’s Voice / De Stem van Zijn Meester: The Dutch Catalogue could suggest that the records were not only issued in the UK for the South African market but also in the Netherlands. View the UK pressing at flatinternational. 1) The EMI Archives in Hayes, Middlesex has unlabeled test pressings of all three discs by Plaatje (4167, 4168 and 4169). It is from these discs that Christopher Ballantine, in the Department of Music at the University of Kwa-Zulu Natal (UKZN), requested copies be made for research purposes in the 1980s.39 These transfers included many additional early and rare recordings on the Zonophone label on cassette and those tapes eventually formed part of the UKZN Music Library collection. With funding from the National Research Foundation, the cassette copies were digitised in 2007 through the South African Music Archive Project (SAMAP) and subsequently hosted online by Digital Innovation South Africa (DISA).40 Shortened samples of these tracks can know be heard at the SAMAP website. 2) The Historical Papers Archive at Wits University has what appears to be a badly cracked original shellac disc which forms part of their collection of Sol Plaatje papers (A979-Df). Many thanks to Gabriele Mohale, Archivist at Historical Papers, for sharing with me images of the cracked disc which is now stored behind glass for protection. The Plaatje documents were given to the collection by Rex Molemo and apparently “were found in a wooden box in a storeroom in Mafeking”.43 This collection also includes a leaflet (A979-Dc) put out by the Zonophone Company advertising Plaatje’s three records. The leaflet is reproduced in Brian Willan’s biography of Sol Plaatje and can also be viewed at the National Papers website.44 National Papers with funding from the Carnegie Foundation undertook to digitize all Plaatje’s documents in 2012. But as the inventory notes reveal, Deborah Wilson, the archivist responsible, was unable to make a recording from the disc because of its damage.45 The collection however does have digital copies of the record as well as Plaatje’s two others which, I assume, they were able to get from the EMI Archives. 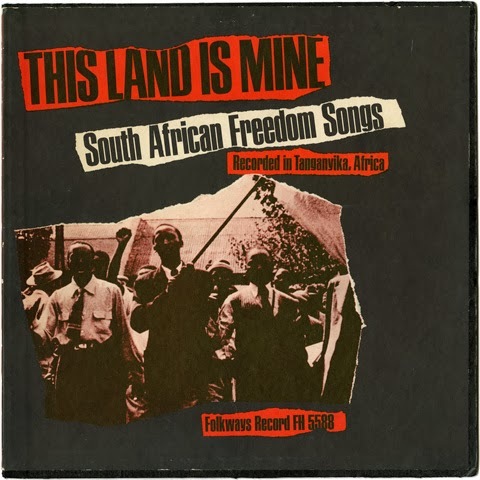 Interestingly, as Willan notes, the track Nkosi Sikelel iAfrika is not listed in the advertising leaflet nor is it identified on the disc label itself. In an online bulletin, Willan has pointed to some speculation over this omission that suggests that the “song was regarded as politically sensitive and that the recording was seditious”.46 Willan, however, disagrees and concludes that the recording may have been an afterthought and the omission simply an oversight by the company. 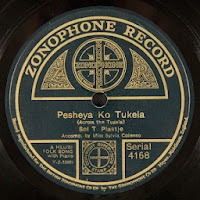 It must be noted however that Kelly’s discographical research, which is sourced from a number of varied documents including the original ledgers from the Gramophone Company, does include the so-called “hidden” track as part b) on the side where Pesheya ko Tukela is part a). It is possible that Kelly’s research may have been informed by Willan’s, however if that be the case, I am sure Willan would not have referred to the track as “Native National Hymn sung in Zulu” which sounds more like historical meta-data derived from old documents. 3) The British Library National Sound Archive in London has digital copies of a severely warped disc that was brought to them in September 1995 by Brian Willan. They applied some significant procedures, including heating the disc in a specially designed oven, to rectify the warpage and make a recording. Willan had been given the disc by a relative of Plaatje’s while in the process of doing his research.47 The NSA through Willan’s assistance were eventually able to secure digital copies of all three discs from the EMI archives. This account and the archiving process are published in their bulletin Playback(issue 12). The recordings can be heard on the NSA tape 10632WR. 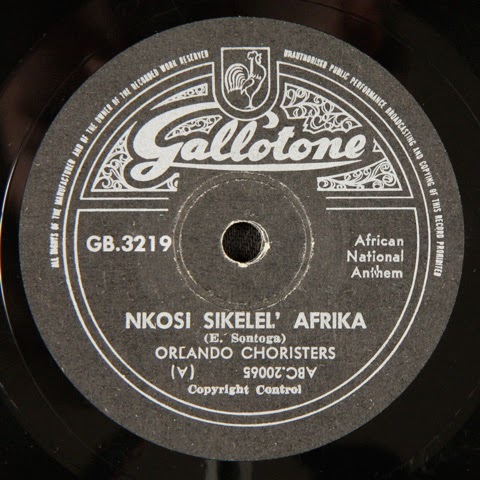 (brown label reissue, 1950s)The next recording of Nkosi Sikelel iAfrika was made around July 1929 by the St. Peters School and Church Choir, conducted by G.A. Broughton. The reverse side has two tracks composed by John Knox Bokwe, and sung by the St. Peters Hostel Choir conducted by G. Nongauza.A number of recordings were made in Johannesburg and these were all issued on Columbia’s light-green Regal label. Regal had been established as a mid-priced label by the company in 1914. The company shifted their coupling number prefix for UK domestic issues to MR in March 1930.48 Some have said that the MR denotes “Magenta Regal” which also happens to be the colour of the label. Likewise this might explain why the light-green labels of the South African issues were given a GR prefix, perhaps for “Green Regal”. An example further down by the Wilberforce Institute Singers shows this early label design.The image above shows a reissue on the Regal Zonophone label but an example on the Regal label does exist in the ILAM archives. Regal Zonophone was a budget label established after Gramophone Company and the Columbia Graphophone Company merged to become EMI (or Electric and Music Industries Limited) in March 1931. 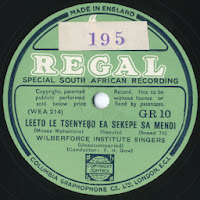 The first records on this new label were issued in January 1933.49Given the change in number prefixes by the Graphophone Company, it is likely that the South African GR series was also issued after March in 1930. The series included songs in a range of Southern African languages including isiXhosa, Sesotho, Afrikaans, Chopi, and Chikaranga (or Shangaan). 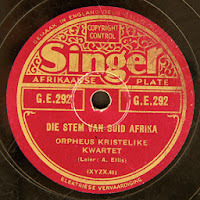 The highest number I have found to date is GR 54 by Die Vyf Vastrappers.50 Of course, I think it is quite significant that the label’s first issue, GR 1, was a recording of Sontonga’s anthem Nkosi Sikelel iAfrika. To be sure, Columbia Graphophone Company, the UK-based competitor of Gramophone Company, had sent a recording unit to South Africa in 1929. Some accounts have this visit as taking place in 1930, but if Tracey’s recollections are right then the correct date would be July 1929. Interestingly, an early photograph in the ILAM Photo Archive shows Tracey recording in Johannesburg with the “Karanga” men. The meta-data for this image states that it was taken “approximately in June 1929” (a month earlier).52 Tracey, in his text, does go on to say that he travelled by train with an additional group of “Karanga” men to Cape Town in 1933 when another Columbia unit visited from the UK. Perhaps someone can identify the style of microphone used in this image, which might help confirm the date. 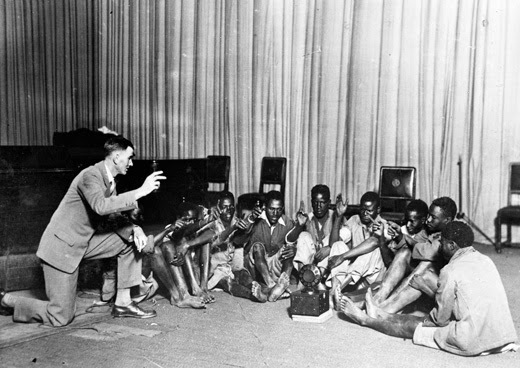 Hugh Tracey with The Chipika Singers, JHB, July 1929. Source ILAM Photo Archive with kind permission. The recordings by the “Karanaga” men were issued on the Regal label as The Chipika Singers (GR 33 – 40) with the matrix numbers WEA 484 – 502.53 The recording of Nkosi Sikelel iAfrika has the matrix number WEA 169 suggesting that is was recorded well before those of The Chipika Singers. To make things a little more complicated these early Regal and Columbia issues have an additional five-digit matrix in the lead-out of the shellac. It is my guess that these were ‘global’ matrix numbers for Columbia’s head office back in the UK and the WEA matrix numbers were applied specifically for the South African issues. While the order of the five-digit numbers does not necessarily match those of the WEA numbers the general chronology does make sense, more-or-less. Nkosi Sikelel iAfrika has the number 54779 (WEA 169) and it comes before recordings by The City Deep Natives from 54971 to 55013 (issued as WEA 238 – 245, GR 15 – 18).54 Therefore, if Tracy’s recollections are correct, I would say the recordings of Nkosi Sikelel iAfrika by St. Peter’s Church and School Choirs are from or before July 1929. View the disc at flatinternational. The school’s impact in shaping the identity of a young Oliver Tambo in the 1930s, was significant. While most pupils were drawn from the Traansvaal, the student body was still culturally eclectic with a broad range of African languages being spoken. Tambo points out: “I was now at an institution that was representative of the whole country, the whole of South Africa – a school that had most of the attributes of a national, as distinct from a local institution. I had entered a wider world”.61 Tambo matriculated from the school in 1938 but when writing his Junior Certificate in 1936, he became the first ‘African’ student to pass with a first-class degree — news that became sensational countrywide at that time. Of course the school’s impact on the history of South African music would not end in choral singing. In 1954, a fourteen year old student was given his first musical instrument by the school’s superintendent. Who would know then what impact this action would have on a very young Hugh Masekela by the Father Trevor Huddleston. Soon other instruments were acquired and Masekela along with his school friend, Jonas Gwangwa, on trombone, formed the legendary Father Huddleston Jazz Band. Motsieloa was subsequently hired by Gallo as a “talent-scout” becoming South Africa’s first black record producer. This opportunity allowed for a steady income, so much so, that in 1932 he quit teaching to concentrate on a full-time stage career. 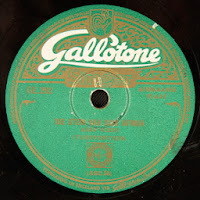 While at Gallo he was responsible for bringing in another historic performer, Solomon Linda and his Original Evening Birds, who recorded the iconic Mbube in 1939. 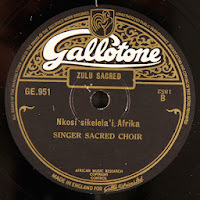 Recorded probably in JohannesburgThis version was recorded in late 1941 or early 1942 by the Singer Sacred Choir and was probably originally issued on the Gallo’s Singer label as GE 951. The highest coupling number I have seen on the Singer label is GE 959. The recording could have been made by Hugh Tracey as the reissue label carries the name of his “African Music Research” unit that was established in 1947 at Gallo Records. 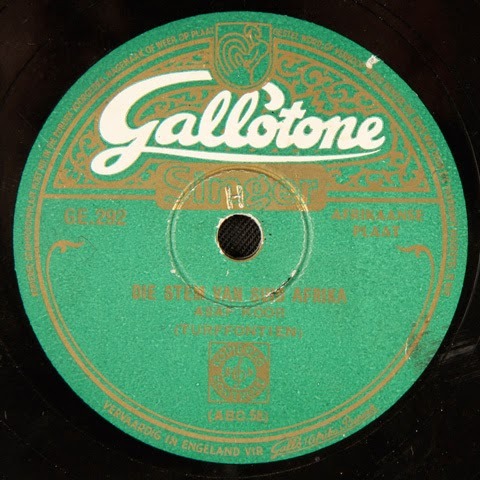 Eric Gallo had provided Tracey the financial support for the project, a place to work and agreed to publish a potion of his recordings on 78 rpm disc under the Gallotone label.79 What is odd though is that the name of the choir carries the Singer name, the label from a time before Tracey joined the company. It is possible that this recording was one that Tracey found in the Gallo archives and simply reissued under his project name. Another oddity is that this disc GE 951(matrix 1852) is backed by the Xhosa Sacred Singers singing Bawo wetu ose zulweni (matrix 1580); whereas another later reissue GB 951 carries a different track on the reverse side. Interestingly that track, Lalelani Izingelosi, was recorded at the same session as Nkosi Sikelel iAfrika by the Singer Sacred Choir (matrix 1850). View the images of GE 951 at flatinternational. HMV EP, 7EYJ6, matrix 7TAS 162This His Master’s Voice EP, titled Africa Calls, features two tracks by the gospel group the King’s Messengers Quartet on side A and then a track each of Nkosi Sikelel iAfrika and Morena Boloka by the New Mission Choir on side B. See Stanza 2 below for more information about this record. Gallotone, GB 3219, ABC 20065This excellent recording of the two “African National Anthems” together on one disc can be heard on the Gallotone 78 rpm by the Orlando Choristers (Gallotone, GB 3219) probably issued in late 1961 or early 1962. Here Nkosi Sikelel iAfrika is credited to Sontonga while Morena Boloka remains uncredited. The timing of this particular issue is striking, given the events that followed the Sharpeville massacre in March of 1960: that being the States of Emergency, the banning of the ANC and PAC, the house arrest of ANC leader, Albert Luthuli, the attempted assassination of then Prime Minister H.F. Verwoerd, and the apparent suppression of any performance of these songs.What began as a religious song had become political — performed at meetings, rallies and gatherings of defiance. It is my understanding that the songs, or at least Nkosi Sikelel iAfrika, were banned, however I have yet to find a date for this or an official reference. Perhaps the South African authorities forbade the performance of the songs in political contexts, and maybe it was tolerated in religious or cultural contexts. Certainly it is ironic that Nkosi Sikelel’ iAfrika, was adopted in 1963 as a national anthem by the newly formed legislative assembly of the Transkei “Bantustan”, with full support of the South African government. See more about this recording in Stanza 2 below. See Stanza 2 below for more information about this record. Protect South Africa, South Africa80To my ear, Morena Boloka, sounds like a completely different tune from that of Nkosi Sikelel iAfrika. And yet by many accounts, the tune is supposed to be the Sotho version or ‘translation’ of the Sontonga’s famous anthem. In his seminal book In Township Tonight David Coplan suggests that “the Sotho verse [was] entirely new and not derived in any way from Sontonga’s or Mqhayi’s Xhosa verses,” and furthermore “was added to promote African Unity by the ANC” and that they “necessarily [changed] the melody due to differences in semantic tone.”81 I interpret Coplan’s account to affirm my suspicion that Morena Boloka might simply be derived from a completely separate and unique song. Coplan in a separate paper from 2002, also suggests that Morena Boloka was “apparently composed and first published in 1942 by Moses Mphahlele.”82 This attribution is, likewise, mentioned widely on a number of reputable websites, though in my online research I was unable to find the original source for this claim. To my knowledge, the first recording of Morena Boloka predates much of this conjecture by thirteen years and was made by the Wilberforce Institute Singers under the direction of Dr. Francis Herman Gow, around July 1929. (Many thanks to Liezl Visagie at ILAM for sending me the label images. 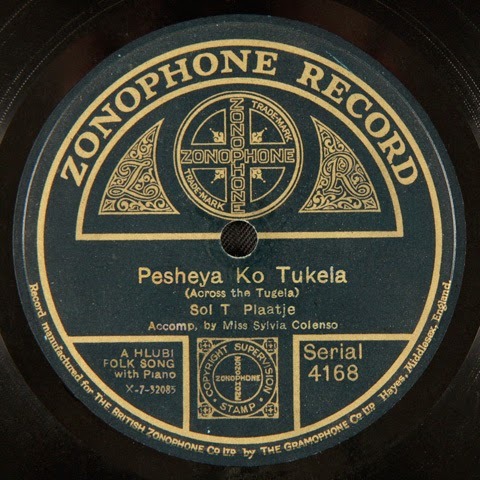 )This recording was made by the same traveling unit sent to South Africa by the Columbia Graphophone Company mentioned earlier. 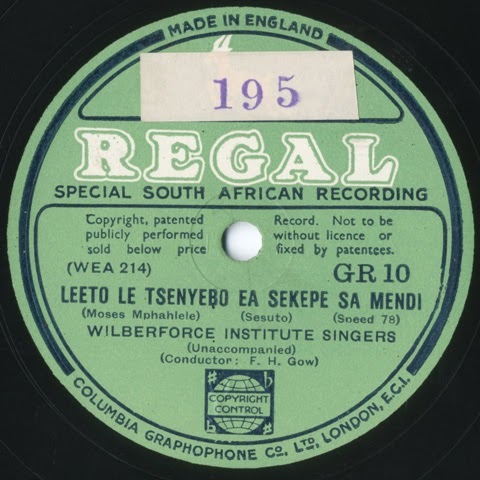 The track was issued on their Regal label with the coupling number GR 10, though, like all versions of Morena Boloka in my research, the composer remains uncredited on the label.83 Interestingly, the so-called B-side features another hymn sung by the Wilberforce Institute Singers, Leeto Le Tsenyebo Ea Sekepe Sa Mendi, and this one is attributed to Moses Mphahlele. 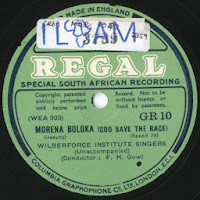 Certainly the fact that his name appears on one side of the same disc suggests that there is definitely a connection between Mphahlele, Gow, the Wilberforce Singers and Morena Boloka. The absence of a composer credit on a disc is nothing new, but the fact that Mphahlele is specifically mentioned on one side and not the other suggests perhaps a song that, at that time, could not be attributed or perhaps one that was deemed historically “traditional”. Likewise, if Sontonga was viewed as the author, his name would have been credited. Moses Mphahlele, a teacher, interpreter, poet and musician, was born in Pietersburg in 1895 and was the ANC Secretary in the Transvaal during the 1920s.84 He died in 1957 and a ceremony at his gravesite can be viewed on YouTube. 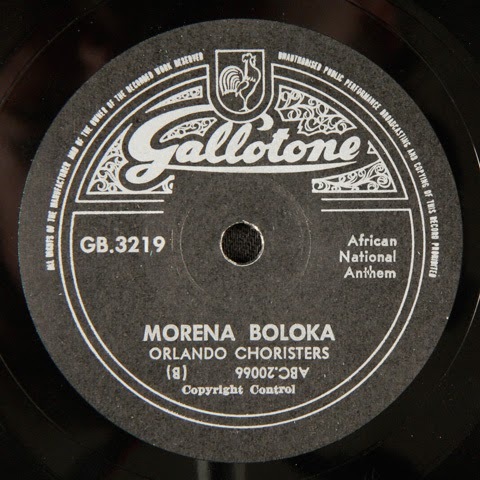 The fact that Morena Boloka, like Nkosi Sikelel iAfrika, was recorded on such an early occasion in 1929 does suggest that the song was viewed, even then, as important and significant. 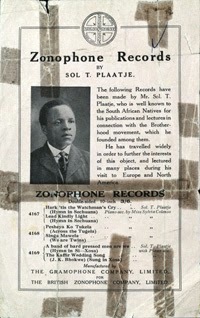 Unlike Plaatje’s Nkosi Sikelel iAfrika, however, there are no earlier examples of the tune in the Zonophone catalogue. View the disc at flatinternational. HMV EP, 7EYJ6, matrix 7TAS 162Generally, later recordings of Morena Boloka from the 1950s and 1960s are always accompanied by but not combined with Nkosi Sikelel iAfrika on the reverse or same side. In most cases Nkosi Sikelel iAfrika is credited to Sontonga whereas Morena Boloka remains uncredited in all. 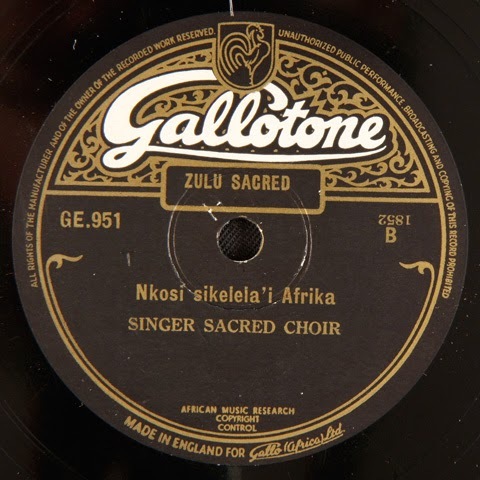 An example of this can be heard on the HMV EP Africa Calls which features two a cappella “spiritual” tracks by the Kings Messengers Quartet on side A and then what is referred to in the liner notes as the “African National Anthems… sung in Zulu [and]… sung in Sotho” by the New Church Mission Choir on side B (His Master’s Voice, 7EYJ 6).The Kings Messengers Quartet’s track There is No Disappointment in Heaven was hugely popular and featured on a number of compilation LPs at that time. 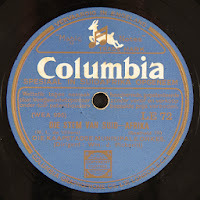 Recorded in 1959, the track was first issued on 78 rpm (His Master’s Voice, JP 501)97 and it is likely that the EP followed shortly after, that same year or possibly in 1960. 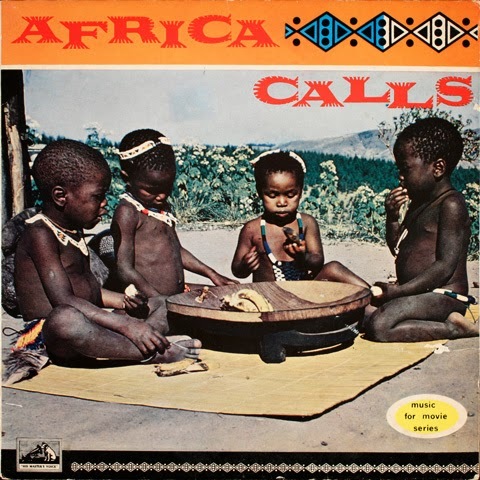 It is interesting that the title of this EP, Africa Calls, in some ways, perhaps unintentionally, references the title of the English version of the then newly approved South African national anthem: The Call of South Africa. “ASSEBLIEF sprekers, wees die amptelike tale genadig! Ten slotte vra one: sing aan die end net een volkslied; sing “Morena Boloka Seshaba sa geso” OR “Nkosi Sikelele iAfrika”. Om altwee te sing is ongemotiveerd en dit rek net die program uit. Speakers, PLEASE, have mercy upon the official languages! Cornelis Jacob Langenhoven, an Afrikaans poet wrote the Die Stem, a patriotic poem with three verses in May of 1918. Born on a farm near Ladismith in the Klein Karoo in 1873, he was an educator, solicitor and the editor of a local Dutch newspaper. At that time English and Dutch were the two ‘official’ languages of South Africa while, for many, Afrikaans was simply viewed as a creolized language of convenience and often derogatively referred to as “kitchen-Dutch”. Langenhoven was a proud and ardent supporter of Afrikaans and wrote extensively in support for it to be accepted in an official capacity. He is quoted as having said: “If Dutch is our Language, we must speak it, if Afrikaans is our Language, we must write it”.105 Afrikaans was officially adopted alongside English as the national language of South Africa in 1925. By some accounts, Langenhoven had composed music for his poem, but critics did not entirely approve of the version and so a competition, sponsored by the newly formed Cape Town newspaper, Die Burger, was organised in 1919. Interestingly the founding editor of that paper, D.F. Malan, would become South Africa’s Prime Minister under the National Party when they took power in 1948. Finally the poem was set to music composed by Marthinus Lourens de Villiers and completed on May 31, 1920,106 the tenth anniversary of the formation of the Union of South Africa. Though most accounts have the final date for the composition as 1921. As mentioned earlier, Langenhoven’s poem originally had only three verses, but a fourth verse was added, by some accounts at the request of the government, to bolster a religious theme. It is not clear to me at what point in the development of the anthem this occurred. The first recording of the future anthem took place in London in 1926 and was made by Betty Steyn. A subsequent orchestral recording of De Villiers composition alone was made by the Cape Town Municipal Orchestra in what I am guessing was 1929 by the visiting Columbia unit and issued on the Columbia blue label. This recording carries the same WEA prefixed matrix numbers that can be found on the first recordings facilitated by Hugh Tracey, in July of 1929. Tracey’s recordings were made in Johannesburg and it seems rather unlikely that the orchestra would travel from Cape Town to make a recording. However the Cape Town Orchestra did travel throughout South Africa at that time and we know that the Columbia unit visited Cape Town in 1933. It is possible that that unit visited both cities on both occasions, but at the moment I can only verify that it was in Johannesburg in 1929 and Cape Town in 1933. One detail that supports my thought that the recording was made on the earlier 1929 visit is that this record is one of the last to carry the five-digit Columbia matrix mentioned earlier. My current thinking is that these were used on the 1929 recordings only and the system was subsequently abandoned after the company merged with Gramophone Company to form EMI. Of course it is possible that the unit came on other occasions after 1929 and before 1933. The flip side of this disc includes the track Botha’s Boys composed by past conductor of the orchestra Theo Wendt. This marching song had first been recorded by a visiting unit sent out by the Edison Bell company in 1924 and issued on their Velvet Face label. The Cape Town Municipal Orchestra made their first performance in February of 1914 in the Cape Town City Hall with Theo Wendt conducting. Wendt resigned in May 1924 and was succeeded by Leslie Howard who was subsequently replaced by William J. Pickerill early in 1927.111 Pickerill remained until October 1946 and it is he who is conducting the Orchestra on these Columbia recordings. The Federasie van Afrikaanse Kultuurverenigings (FAK) or Federation of Afrikaans Cultural Societies was formed in Bloemfontein in 1929 with the main objective of promoting Afrikaans with a co-ordinated and constructive agenda.114 The organisation also had the goal of reaching a consensus amongst Afrikaners on an anthem in Afrikaans that could be sung side-by-side with God Save the King. The Union of South Africa, then under the dominion of the British Empire, had adopted this anthem with its formation in 1910. In 1936 the FAK finally and unanimously accepted the poem by Langenhoven set to the music of De Villiers as the Afrikaans national anthem.115 It is not clear to me when Die Stem was officially accepted by the government to be played alongside God Save the Queen though it is possible that this had already been taking place since the anthem was first publicly performed in 1928. Singer, GE 292 (red label), matrix XYZX 46. This particular disc is quite unusual in that it was issued with a red Singer label. 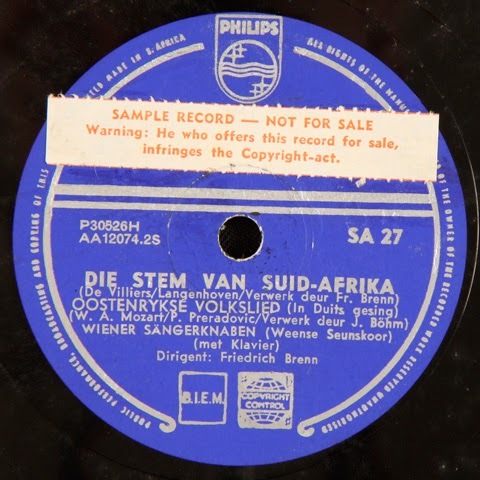 Most Singer labels for Afrikaans recordings were issued with green labels. Another oddity is that the coupling number GE 292 was reissued or ‘issued’ on the green label also with Die Stem but sung by a completely different group: the ASAF Choir. Gallotone Singer, GE 292 (green label), matrix ABC 58. It is likely that both these tracks were recorded around the time of the Voortrekker Eeufees or the Voortrekker Centenary Festival which took place in 1938. To be sure the opening introduction to the track by the ASAF Koor (Choir) mentions that it was recorded in the year of the Festival. The Voortrekker Centenary Festival was organised by Afrikaner Nationalists and included a re-enactment of the “Great Trek” which had occurred 100 years before when Afrikaner farmers, disgruntled with their situation in the Cape, moved into the interior of South Africa. The Festival re-enactment began in Cape Town on August 8th, 1938116 and ended with the laying of the cornerstone at the site of the Voortrekker Monument near Pretoria on December 16th, 1938.117 It is not clear at what point the recording is made during the Festival, but I suspect the later date may be the correct one. As the South African Music Encyclopedia (SAME) reveals, the ASAF Choir was founded in the home of S.J. Buys in Johannesburg on July 5th, 1920. H.A. Delen, the choir’s first conductor, was soon replaced by Johan Bernard Zulch Keet in 1921 who stayed with the Choir until 1963.118 It is Keet who is conducting the Turffontein Choir on this recording as the spoken introduction points out. The Turffontein Choir was formed in 1924 and was one of several smaller choirs that would rehearse separately. These choirs would then all come together as the ASAF Choir for larger events. 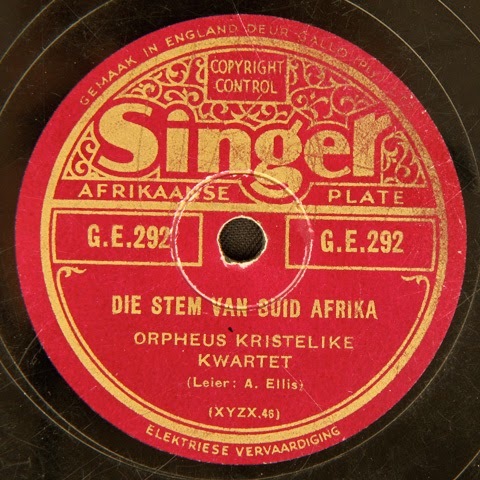 The choir featured at many official events like the one on this disc and was sought after for other Afrikaans cultural festivals.119 Note that this is the same Choir under Keet that sings the official bilingual production of Die Stem and The Call issued by the SABC in 1960. More about this recording below. Possibly one of the sweetest versions of the anthem I have heard sung in Afrikaans but with a definite German accent. The Boer War between colonial England and the two Boer republics ended in 1902 and subsequently in 1910 the Union of South Africa was formed as a dominion of the British Empire. In the 1920s, a compromise between Afrikaner Nationalists on one side, and the pro-British English-speaking population on the other — both white — was for the country to have two flags and two anthems: the Union Flag flown side by side with the Union Jack and Die Stem van Suid-Afrika sung together with God Save the King (or Queen). Interestingly, as Bekker reveals, the debates that followed in the House of Assembly proved to be quite heated. For example, Douglas Mitchell, a United Party MP, rejected the motion on account that it bred division, but also noted that there was an additional anthem being sung by millions of black South Africans: Nkosi Sikelel iAfrika. The controversy was felt worldwide within the British Commonwealth and made the front pages of papers like the Ottawa Citizen. Dönges, the newspaper reported, had to roll back Strijdom’s statement somewhat by saying that God Save the Queen would still be played at official functions where appropriate.127 The British anthem though from then on was dropped. South Africa would eventually leave the Commonwealth and become a Republic on May 31st, 1961. 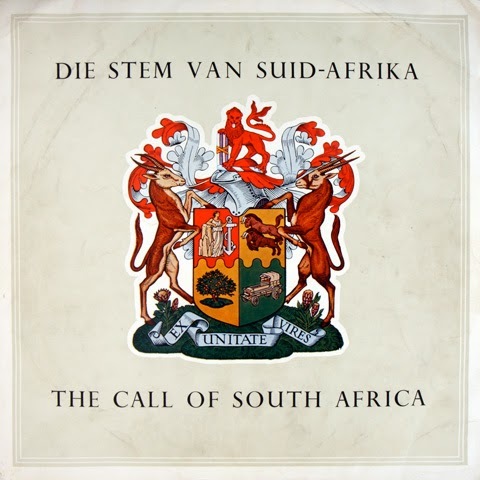 The government sought to claim the copyright of Die Stem van Suid Afrika from the estate of Langenhoven and officially acquired the rights to the poem in the Copyright Act of 1959.128 View a PDF of that document here. It is interesting to note that the words “the call” are used in the first line of the only stanza of the new anthem that has been severely modified from its original version. Below is the opening stanza of the original 1957 version of The Call in English. The first two lines represent the Afrikaans third stanza (or Die Stem) in the current version of the anthem. The fourth English stanza of the current version is derived in part from the last three lines of the original English version. Of course the new lyrics have been heavily adapted but there are a number of themes and words (that I have underlined below) that are common to both new and old versions. SABC Transcription Service, LT 1735/6To my knowledge, the first recording of the original English version of The Call was issued on an SABC transcription disc in what I am assuming was 1960. 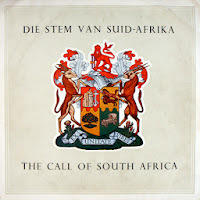 This assumption is based on the fact that the back cover carries the red Union Festival Emblem of the fiftieth anniversary of the Union of South African, which took place in May 1960. The recording may have occurred earlier somewhere between 1957 and 1960. Transcription discs were for the most part issued in limited pressings with generic covers and distributed to radio stations around South Africa and internationally. 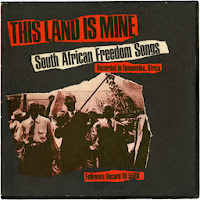 This particular disc is unique in that it came with a specially designed cover and detailed liner notes and may have been issued as a collectable for the general public.What was to become a standard procedure in ‘white’ South Africa, the disc was issued completely bilingually in English and Afrikaans. 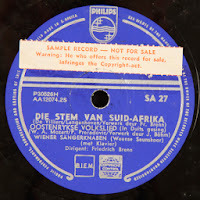 Side A in Afrikaans was exactly the same as side B in English and both sides featured four versions of the anthem: the full version sung with orchestra; an orchestral rendition alone; unaccompanied readings of the anthem by Jan Schutte in Afrikaans and Philip Burgers in English; and then an identical military version played by the Band of the South African Air Force directed by Captain J. E. Koops van’t Jagt.The only difference between the two sides (other than the obvious language differences) can be found in the liner notes. The English text includes this sentence: “The English version, compiled from various individual translations, was officially approved by the Government in 1957” while the Afrikaans translation omits this detail.131 Perhaps this omission reflects the continuation of long-felt acrimony between the two so-called ‘white’ language and therefore cultural groups in South Africa that had existed since, at least, the Boer Wars and, perhaps to a lesser extent, continues today. What is implied in this phrasing in the liner notes is this: explaining in Afrikaans where the English translation came from needs no explanation, because the Afrikaans version is the ‘only version’ and ‘derivatives’ need no explanation.Having said that, I seldom recall singing the English version of the anthem as a youth growing up in Durban in the 1970s and 80s. Durban of course, at that time, was considered to be the most ‘English’ of South African cities. As I read the 1957 English lyrics, they seem quite unfamiliar to me, though mind you anything beyond the first stanza of the Afrikaans version seems for me to be ‘lost in the grass’. Perhaps for that reason it was the English lyrics that were open to be radically altered in the new version of the anthem without the fear of too much recrimination. Of course, on a separate note, the 702 interview was prompted by a notoriously poor performance of the national anthem, by reggae star, Ras Dumasani at an international rugby match between South Africa and France. South Africa lost the match and Dumasani was blamed. View the performance here at YouTube. Nevertheless after six months of deliberation, the Anthem Committee made a number of proposals to the Cabinet in July of 1995 and the current anthem was chosen. After a proclamation, No. 68, by President Nelson Mandela in the Government Gazette, No. 18341, dated October 10, 1997145 the shortened and adapted versions of Nkosi Sikelel iAfrika (in isiXhosa and isiZulu), Morena Boloka (in Sesotho), Die Stem van Suid-Afrika(in Afrikaans) and The Call of South Africa (in English) were merged and adopted as the official South African National Anthem.